This is my second (and final) blog post about mountain biking in Madeira. You can read my first post here. The Madeiran landscape is extremely steep, reflected by the fact that the island of only 800 square kilometers has several peaks over 1800 meters. The vegetation almost King Kong-like, and local weather differences often shroud the tallest peaks in clouds, as if hiding something. Many times in my life, the saying 'Don't like the weather? Wait a minute!' has applied. Nowhere has it been more appropriate than in Madeira. Driving for five minutes could be the difference between sun and pouring rain. We were on the receiving end of both during our five days of riding. Extreme climate requires extreme measures for agriculture. The hillsides all over Madeira are riddled with terraces that host bananas and other crops, as well as grapevines. The terraces looked like they must be incredibly time-consuming to build, but they must be indispensable enough to justify the work. Madeirans seem to have built stairs with the same enthusiasm they built agricultural terraces. 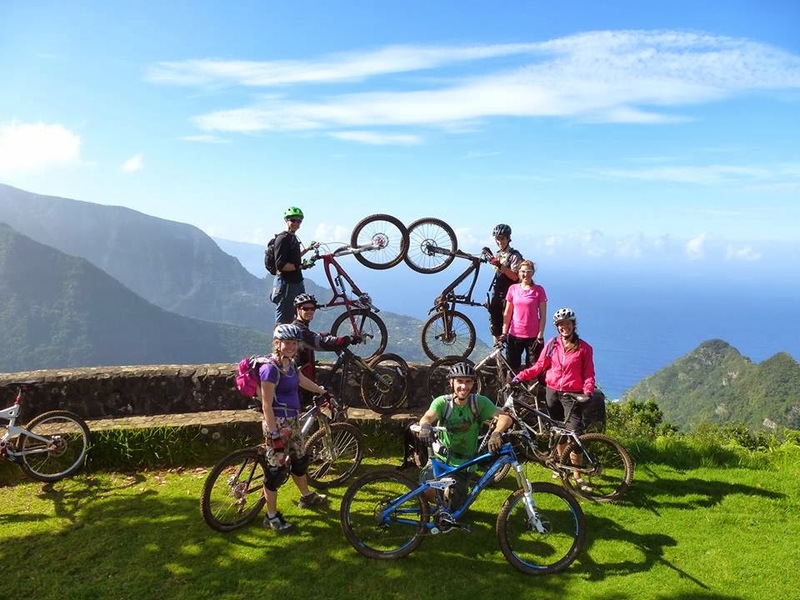 I can safely say I have never biked down as many stairs in my life as I did in Madeira. I have sort of mixed feelings about biking down stairs. Sometimes I felt like the 'Stairmaster' and was (excessively) proud of making it down. Other time I just got sick of being rattled up. The wet weather during a few of the days of our trip turned the soft soil into churned mud in many places. This results in slippery biking, and a number of endos and sliding falls. Synne hit her face like a pro. Our last day of riding was so muddy we went back to the hotel midday to dry off before heading out for a few more hours. ...to exposed cliffs overlooking the ocean. Some of the forests in Madeira burn periodically; several times the trails were in bad shape because they had burned recently and hadn't been built up to their former glory. But burnt trees with bright green ferns tinting the stark forests made for dramatic riding. One of the coolest places we biked through was an open grassy field at around 1500 meters with mushroom-shaped trees and cows grazing. I thought the cows look peaceful, but some of the others were sceptical. They don't take the horns off cows in Madeira, so if they got angry it would be scary. The whole scene was rather Lord of the Rings-like. Suffice to same that my shins are in the same state. 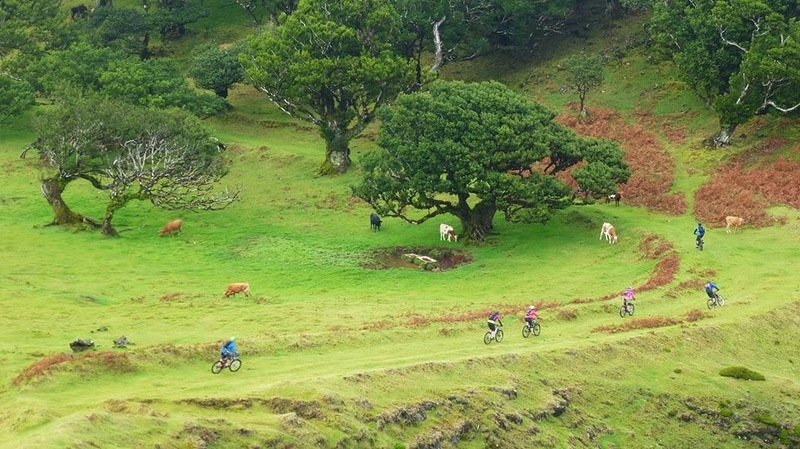 Another cool feature of biking in Madeira is the levadas. Levadas are irrigation channels that run from the wet side of the island to the dry side. There are paths along them which are popular among hikers. We would often follow the levadas to connect different bits of trail. Ride along a levada isn't particular technically challenging, as the trails along are quite smooth, but the paths can be quite narrow, and thus require a certain focus. The levada is the channel next to the trail. The dweebs in the bushes are picking blueberries. This trip was, like Morocco, a test of biking endurance from day to day. One thing I really learned is how much mind can weigh over matter, how deciding to have fun can really make all the difference. We biked for 4 consecutive days, before having one day off and then a final day of biking. On day four, I was very tired. From the moment I got on the bike I felt shaken and like I couldn't really focus. I was really ready for a day off to relax my sore muscles, and I regretfully behaved that way. I was biking slowly and balking at the slightest technically difficulties. When we got back to the van in the afternoon, John asked if we wanted to do one more run, from the top of Pico do Arieiro all the way down to Funchal. At first Synne, Ingvild and I all said no, and we agreed to drop the others off before we would be shuttled back to the hotel. When we reached Pico do Arieiro, Ingvild changed her mind. "I want to go, I still have energy left", she said. Synne indicated that if Ingvild went, she would go too. So I would be the only one who chickened out of the last run. A voice in my head was whining, I'm so tired, why is no one else tired? I just want to go lie down. Why can't we just all go lie down? But the only thing stronger than that voice was my competitive instinct. I couldn't let the other girls go and sit around like some pampered princess. So I decided I would go. And I decided I would damn well have fun doing it. I had one of my best runs of the trip, but also my hardest crash of the trip (no Wild Bazilchuks were seriously injured during the making of this blog post). Serves me right for biking hard when I was that tired! The whole gang, included Swiss Thierry who joined us for one day, posin'. 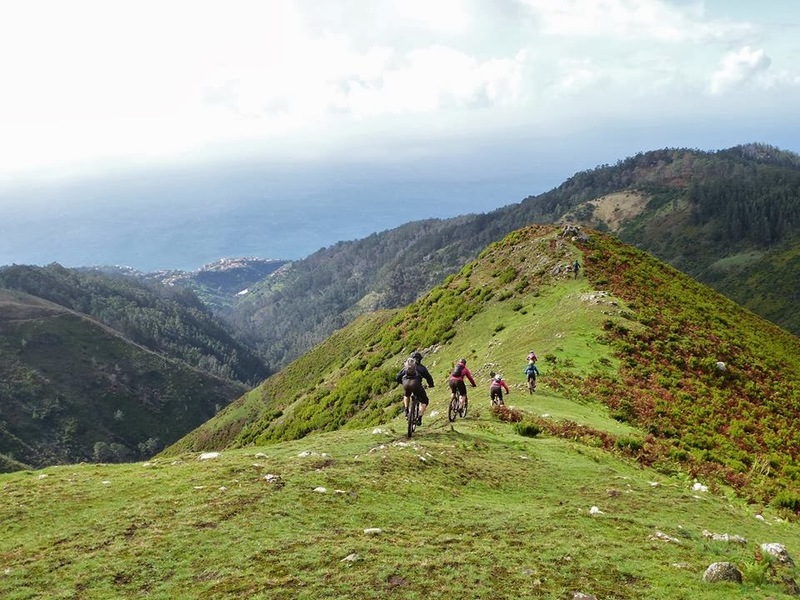 Madeira was rougher and tougher than Morocco, although there's plenty of challenging biking to be done in both places. Thanks for a stunning week of biking - now Norway, time to bring me some snow!